The ZTE Skate is one of the budget smartphone maker's first first own-branded handset in the UK, along with the ZTE Racer, sporting Google's Android OS. Packing Android 2.3 and sticking with the lower end markets which it has serviced in the past, the ZTE Skate is far from being an Apple iPhone 4S or Samsung Galaxy S 2 challenger with the heavily plastic construction and limited hardware capabilities seeing it rest firmly within the company of a selection of Nokia Symbian devices and the odd Huawei and budget HTC handset. While cheap can on occasion be cheerful, it is more often than not, clunky and less than appealing. Unfortunately the ZTE Skate has straddled these two sides of the fence with a predominately sturdy chassis let down by a selection of low grade components and uninspiring design characteristics. The handset as a whole is relatively reassuring in the hand, with the lightweight 120g form offering little flex when under pressure despite its predominantly plastic construct, but the Skate's physical buttons are low grade, fiddly and unnervingly loose within their housings. Far from the slimmest handset on the market at 10.4mm thick, the ZTE Skate's largely benign and standardised design features one large blemish in the form of the 3.5mm audio jack. Stuck to the device's upper rear panel like a country home's vintage chimney, the port is unnecessarily obtrusive acting as an eyesore to what is a largely smooth finish. Despite boasting a number of camera credentials which on paper sound impressive - 5-megapixel sensor, auto focus and LED flash - the ZTE Skate's snapper is wholly disappointing. No matter whether the camera's flash is on or off the device seems incapable of correctly detecting light conditions even in the most perfectly lit of environments. The result of this lack of sensory skills is poor colour management throughout all pictures with ugly images offering little sharpness, depth of field or intricate clarity. Not without merit, however, and despite not offering a dedicated macro mode the Skate's camera comes into its own when in close proximity to its subject providing focus and detail just centimetres from the camera's sensor. Disappointing in a number of key areas, the ZTE Skate's 4.3-inch TFT display, with an 800 x 480p resolution, is grainy and lacking in clarity whilst the device's 5-hour talktime battery life leaves a lot to be desired. While there is little to be said about the now very familiar and increasingly dated unskinned Android 2.3 Gingerbread version of the Google mobile OS residing upon the Skate, with all Gingerbread devices, the Operating System offers a smooth and seamless user experience. The easy to navigate Gingerbread OS is let down in part by the Skate's clunky operational abilities, however. 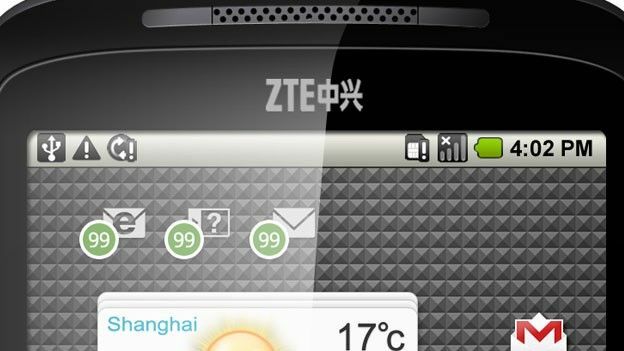 With an 800MHz processor and 512MB of RAM, the ZTE device is hardly breaking new ground resulting in slightly jilted homescreen transitions and more than a moment's lag when opening up applications or returning to the main menu. The least that can be expected from a budget smartphone is for the device to live up to its pocket blower credentials and offer acceptable audio abilities while in calls. Again, the Skate slips up on this front with the handset's audio output lacking crisp notes and proving quite tinny. Judged against a selection of market leading smartphone powerhouses, the ZTE Skate is a laughable offering. Up against its closest and comparable competitors, it still falls slightly short of the mark, making it an unlikey contender for our list of the best smartphones to buy. While a price tag in the region of the £200 - £250 mark is one clogged by a fleet of disappointing devices, there are a number that sparkle much brighter than the ZTE Skate, with sleeker designs, higherspecs and better performance.